AMONG the modern German aircraft passed by the Commission of Guarantees as conforming to the regulations restricting horse-power, etc., of commercial machines is a very interesting little ДальшеMore>>> two-seater seaplane designed by Herr Heinkel and built by the Caspar Werke of Trawemunde. Compactness and ease of erecting and dismantling are the predominant features aimed at, and it is rumoured that the machine may be used from a large submarine. In fact, the United States Government has purchased one of these machines with, it is stated, the intention of testing the suitability of the Caspar U1 for this purpose. This fact may explain the reason for so designing the machine that it will, as indicated in the accompanying diagrams, pack into a cylindrical case measuring 24 ft. 4 ins. in length by 5 ft. 7 ins. diameter. Compactness and ease of dismantling being the chief considerations, the Caspar U1 was made a biplane, the monoplane wing of the same area being too large for the purpose, and in order to facilitate removing and erecting the wings these were made cantilever surfaces. In the case of the bottom plane this arrangement is probably quite satisfactory, but we confess we have certain misgivings concerning the top plane. From the front elevation of the machine it will be seen that the width of the excrescence on the fuselage, which carries the top plane, is relatively narrow - about 18 ins., and the soundness of attaching to such a narrow structure the upper, and more heavily stressed, wing of a biplane may be questioned. It is not so much a matter of pure bending stresses, although these will probably be serious enough, as of torsion and rocking of the wing. To make matters worse, the ailerons are fitted to the top plane, so that the loads tending to twist and rock the wing may be assumed to be increased. By using an excess of material it is, of course, possible to provide the necessary strength, but at the expense of a good deal of weight. We should have thought that it would have been preferable to use a pair of lift struts on each side, but probably this would have meant a departure from the ideal which the designer had set himself, and certainly it would have meant extra fastenings to undo when dismantling the machine. It may be that the present arrangement, entailing a somewhat greater weight, was chosen deliberately in order to retain the extraordinary simplicity of the wing attachments. Facility of erecting and dismantling has been carried to such perfection that no tool of any sort is required for these operations. The wings are locked in place by the movement of a single lever projecting from the fuselage, the movement securing both wings at once. For removing the wings the lever is moved in the opposite direction, when the top plane can be lifted off and the lower plane withdrawn by sliding it out of its notch in the bottom of the fuselage. The aileron controls must, of course, be broken and joined up again, but the fittings used are such as to require no tools. The two floats, which are of the single-step type with flat bottom ahead of the step and V-bottom aft of it, are of sufficient length to avoid the use of a tail float. They are mounted on steel tube struts, and the attachments are such as to avoid the use of tools. The fittings on the floats and fuselage are in the form of steel hooks pointing away from one another. When, therefore, the diagonal cable on each side is slacked off, by means of a quick-release, the strut ends can slide out of the hooks and float and struts removed from the fuselage. Laterally the float struts are so triangulated as to form a letter M, with the float cross-tubes joining the lower ends of the limbs. The fuselage is built of wood, and covered with three-ply. The excrescence carrying the top plane contains the petrol tank, so that direct gravity feed to the carburettor can be employed, thus simplifying the petrol system. The pilot's cockpit is immediately aft of the top plane, and as the wings are fairly heavily staggered he obtains an excellent view. The vertical fin is built integral with the fuselage, and the rudder, tail plane, and elevators are built up of steel tubing and fabric covered. In order to save stowage space, the two halves of the tail plane are hinged on their upper surface, near the sides of the fuselage, and by removing a pin they can be folded up against the fin. A Siemens five-cylinder radial air-cooled engine is mounted in the. nose, and neatly cowled-in, with the cylinder heads projecting. The propeller is secured by a sort of bayonet joint, a 90° turn unlocking the propeller boss from its hub Again no tool is required. Petrol sufficient for a two-hours' flight at full throttle is carried, giving a range of approximately 180 miles. It is stated that a crew of four men can erect the machine in 1 min. 5 secs., and dismantle it in 1 min. Following are the main characteristics of the Caspar U1: Length, o.a., 6-2 ms. (20 ft. 4 ins. ); span, 7-2 ms. (23 ft. 7 ins. ); chord, 1-1 m. (3 ft. 7 ins. ); wing area, 14 sq. ms. (150 sq. ft.); length of floats, 4-1 ms. (13 ft. 6 ins. ); volume of floats, 430 litres (approximately 15 cubic ft.); weight of floats, 26 kgs. (57 lbs. ); spacing of floats, 1 -9 m. (6 ft. 3 ins.) over centre lines: Weight of machine empty, 360 kgs. (790 lbs.). Useful load, 150 kgs. (330 lbs.). Total loaded weight, 510 kgs. (1,120 lbs.). Wing loading, 7-46 lbs./sq. ft. Power loading, 18-7 lbs./h.p. Maximum speed, 145 kms. (90m.p.h.). Cruising speed, 75 m.p.h. Landing speed, 75 kms. (47 miles) per hour. Climb to 1,000 ms. (3,280 ft.) in 7 mins. While the all-metal German school is represented by Dornier and Junkers, the all-wood school has found a worthy champion in the Caspar Werke of Travemunde, of which Generaldirektor Dr. Ing. N. C. Carl Caspar is the moving spirit. It should be stated that both the machines exhibited were designed by Ernst von Loessl, who is a relative (cousin) of the von Loessl who lost his life in a glider accident in the Rhon some years ago. Both machines are built almost entirely of wood, with, of course, the exception of a few fittings that must necessarily be made of steel. The Caspar U.I was described and illustrated in our issue of June 14, 1923. A few supplementary details, as revealed by a closer inspection at Gothenburg, may, however, be of interest. The Caspar U.I was designed for use from a submarine, or from a ship of the mercantile marine wishing to have available a seaplane for carrying urgent messages to port when the ship is still some distance out to sea. The machine is a cantilever biplane of exceptionally clean lines, and has been especially designed for ease of erecting and dismantling, these operations being possible without the use of any tools with the exception of a spanner for turning the propeller boss nut through an angle of 90°. The U.I is covered entirely with three-ply wood, and while this provides a very beautiful finish, it is scarcely the best material for use at sea. In fact, our experience in England has been that three-ply is not suitable for use on seaplanes. Trouble may therefore be experienced with the Caspar U.I on this score, specially with the floats. Otherwise the design is very pleasing to the eye and well thought out. One of our sets of sketches shows the details of the folding tail plane. A form of bayonet joint holds the tail in place, and when this is unlocked, by means of a lever, the tail can be swung up, as there is a universal joint in the elevator tube, and is locked in position by a flat curved strut having a notch engaging with a pin, and pressed into position by a spring so as to lock automatically as soon as the tail plane is in its vertical position. A somewhat similar arrangement is used for securing the main planes to the fuselage. The movement of a single lever, placed under the forepart of the body, releases the catches, and both wings can be pulled off. In the case of the float attachments these also come adrift without using tools, a quick-release turnbuckle in one of the diagonal cables allowing the floats to be removed and the float struts folded. This is the subject of a sketch. After giving a nut on the propeller hub a 90° turn with a spanner, the propeller can be removed. The engine, a five-cylinder Siemens radial of 60 h.p., is mounted on a swivelling mount, but two petrol joints have to be broken before the engine can be swung out. The machine, as already stated, is of exceptionally pleasing lines, and but for the doubt as to the suitability of the three-ply covering for a seaplane, the U.I is a very fine little machine. 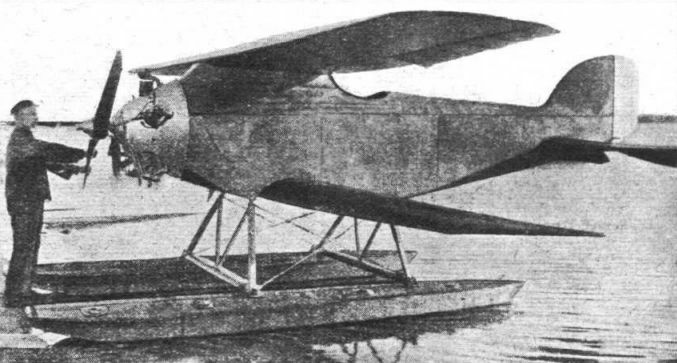 The Caspar seaplane: three-quarter front view. The Caspar U.I cantilever biplane: This machine can be dismantled, without using a single tool, by four men in 1 min. 10 secs. The engine is mounted on a swivelling mount, somewhat after the fashion patented by Boulton and Paul, Ltd. THE CASPAR SEAPLANE: On the right, the machine in flight. On the left, front view; and, below, dismantling the wings. 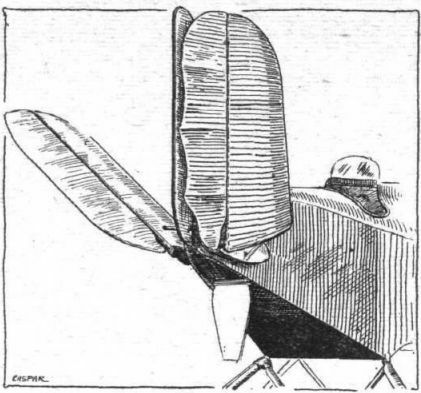 THE CASPAR SEAPLANE: Sketch showing how tail is folded. 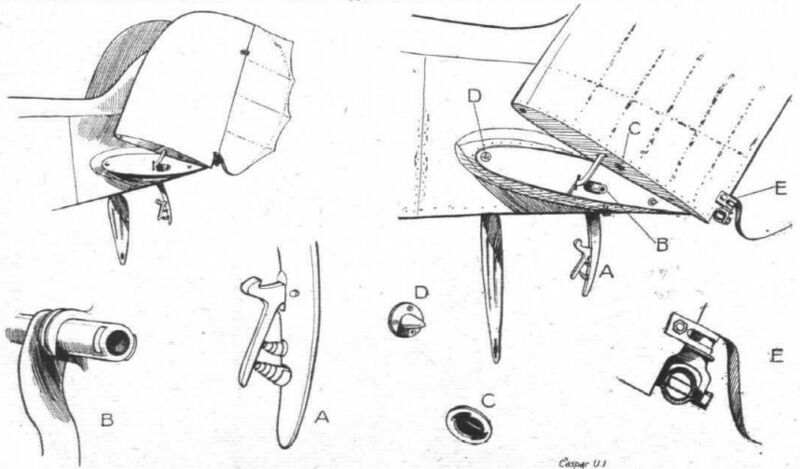 THE CASPAR SEAPLANE: Details of float attachment. 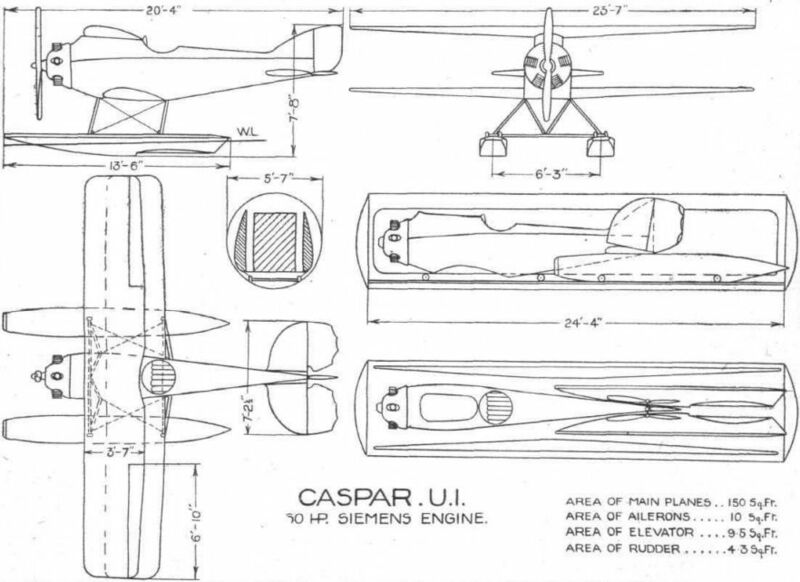 THE CASPAR TYPE U.l SEAPLANE: Some constructional details. The whole of the machine can be dismantled without the use of tools. Our sketches show the details of the folding tail plane. When a trap door in the bottom of the fuselage is opened the lever A can be pulled down, and thereby releases the bayonet joint BC. The tail is then free to be swung upwards, as the elevator tube has a universal joint at E. Short pegs or dowels, D, take the shear at leading and trailing edges when the tail is spread.